This is an amazing, incredible resource for people interested in the paranormal. This radio station starts playing right away in your browser when you visit the page. The paranormal shows here include Paranormal Round Table; Between Two Worlds; the Paranormal Underground; The Buzz; Paravizionz; The Skeptical Edge; Zombiepalooza; and inexplicably, a reggae jams hour. Lots of interesting things to listen to here if you are into this kind of thing. This Massachusetts-based Etsy shop sells absolutely horrific Halloween corpse head props. I haven't seen any this cool in my wanderings, ever. This one is a lamp, how terrifying! Rachael Forbes' stunningly beautiful clothing from England. Her designs are inspired by insects and amphibians. She describes the clothing as "theatrical." Her shop sells custom corsets, capes, skirts, headpieces, and neckpieces. Check out some of the incredible hybrid outfits, such as this Muscae. I've never seen anything like these, and I mean that as a compliment! This shop sells amazing furniture (such as an Elvira vanity and a Bride of Frankenstein set of drawers). They also sell horror T-shirts, jewelry, bathroom decor, grooming products and some garage signs. Shop online, or visit their brick-and-mortar store in Whittier, CA. Somehow I missed this well done fan site when I wrote 25 Most Useful Walking Dead Links. It offers a podcast ( "Radio Free Woodbury"), info on Walking Dead collectibles, the comic, the TV show interviews and a chatroom. I've heard from so many black goths over my 20 years of running Dark Side of the Net about how difficult it is to feel like they fit into the scene and finding other black goths in the community. I'm yet again so grateful for Facebook (and Livejournal years ago) for helping foster communities of like minded individuals with similar interests. 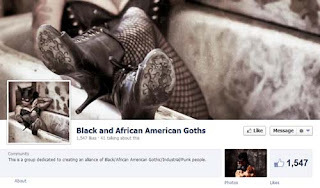 This community boasts over 1500 members, including goths and fans of industrial music. It's active every single day too, which is a plus! This zombie fansite offers a Walking Dead podcast, news, interviews, reviews, and info on zombie comics, TV and movies. 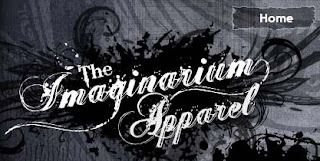 OMG THE IMAGINARIUM APPAREL!! That is some NICE stuff! !